Brewery: Toppling Goliath Brewing Co.
Quick Take: For a malty pale that drinks like an IPA, this is one of the best. It’s more substantial than Zombie Dust but the malt body doesn’t overrun the delicate Citra hopping. A confident celebration of the Citra hop, and an example of what an expert brewer can do with a no frills approach that relies on technique rather than adjuncts and gimmicks. 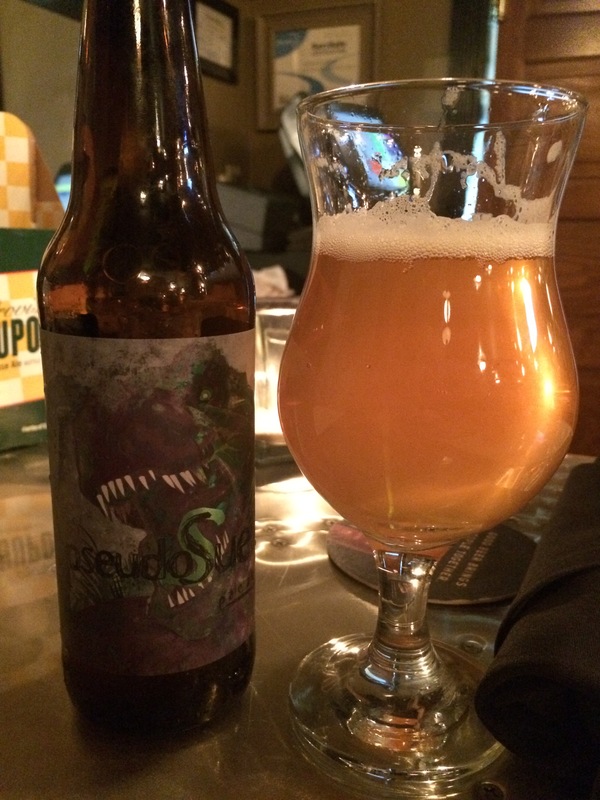 Brew Facts: Pseudosue is a single-hopped Citra pale, similar to 3 Floyds’ Zombie Dust. It was named after the largest T-Rex fossil found, nicknamed “Sue”, hence the giant reptile on the label and the pseudo moniker. If you add a crown and kick up this pale into an imperial IPA, you get Pseudos bigger sister, King Sue. Appearance: This pours a huge, foaming white head of uneven bubbles that reduces to a few clingy ropes of lace and fluff. A gander at the glass below shines clear gold with just a touch of cloudy haze. Quite fetching look for a pale and has the sheen of a certain undead 3 Floyd’s beer, but with more murk. I want it inside me. Aroma: Before we get intimate, a sniff finds creamy mandarin, grapefruit, and pine. There is a touch of candied sugar sweetness and a suggestion of nose tingling booze that is never fully realized. I think this is a result of a citrus acidity. Nice use of Citra to create a fragrant aroma that is assured and clean without the malt sweetness dulling it. I’ll say it does muddle a bit as it warms with a toasty hop smell I’ve found in some session IPAs (Lost Galaxy, Boat). Taste/Mouth Feel: I tip it up, take it in and I’m surprised by just how inconsequential Pseudosue feels in the mouth. The lite fluffiness of the head carries through to a mouthfeel akin to the aforementioned back-from-the-dead 3 Floyds pale. Like sipping on a summer cloud and ultimately smooth and quite refreshing. Not that I’d anticipate much weight from a near 6% pale, but only a few breweries can pull off a body this light without being watery. My scrambled brain parts start working again and reconnect to my taste buds. They find a distinctly delicious flavor hit of mango and tangerine that avoids a bold, tart grapefruit. Light pine follows as does a perfumey floral note that whispers through. An undercurrent of caramel malt asserts itself enough to consider this a sweeter pale, but not a malt beast. The finish is dry, crisp, and leaves a pleasing flavor of orange pith on the tongue. Final Thoughts: For a malty pale that drinks like an IPA, this is one of the best. It’s more substantial than Zombie Dust but the malt body doesn’t overrun the delicate Citra hopping. I see this as an everyday drinker to keep in the fridge along with my other non-accessible to PA drinkers like Westbrook’s One Claw and Half Acre’s Heyoka…err Senita…umm GoneAway (that’s the current one, right? Edit: Turns out GoneAway is available in my area starting today…who knew!). A confident celebration of the Citra hop, and an example of what an expert brewer can do with a no frills approach that relies on technique rather than adjuncts and gimmicks. Sure, there’s nothing wrong with a Peach Pumpkin Ale, but it’s far more impressive when the brewing art triumphs with yeast, water, grain and hops. Side Note: This pairs rather well with yuzu salmon tacos should you find yourself around both. Previous Post Beer is Going Back to Camp!